Separate the eggs, then mingle the egg yolks with 50 ml water. Add the sugar, and mix it until you can`t feel the sugar. Warm up 50 ml water, and add to it the cocoa powder. Mix it well with the egg yolks and the sugar. Beat the egg whites with a pinch of salt. In the egg yolks mixture, add slowly the oil, flour and the baking powder. And finally, add the egg whites foam. The composition is now ready, bake it for about 30 minutes, at 180 degrees. Last time, my basic cake did not succeed as I hoped so. You can check out why here. But this time, I used some butter and flour on the tin, and my basic cake looks amazing. Just mix the mascarpone with the Nutella, and it`s done. And of course, I used some Ferrero Rocher candies. But my Ferrero Rocher birthday cake was a hit. Everybody loved it. Looks so good!! Thanks so much for taking the time to visit!! Oh how pretty - and how delicious your cake looks too! Sharing on the Hearth and Soul Facebook page. Thank you so much for being a part of Hearth and Soul, Cris. Hey there! Visiting from #fandayfriday :) just wanted to say I'm the weirdo that doesn't like Ferrero Rocher, but wow your cake looks delicious! Makes me want to give the chocolate a chance again haha! Cristina you are so funny accusing everyone of stealing your hazelnuts. I'm glad you found them and now everyone is off the hook. Pinning and sharing with my daughter who is making me fat from all the pasteries I get to taste. Your cake looks and sounds simply amazing!!! I love those candies so much, too. Hazelnut is my fave. Happy belated birthday!!! Thanks Diane, and thanks for taking the time to visit! Have a great day. It looks so delicious! Thank you for sharing at Ravenwould. I love Ferrero Rochers to this is the cake for me !! Absolutely mouthwatering and beautiful! Thanks for sharing with Awesome Life Friday! 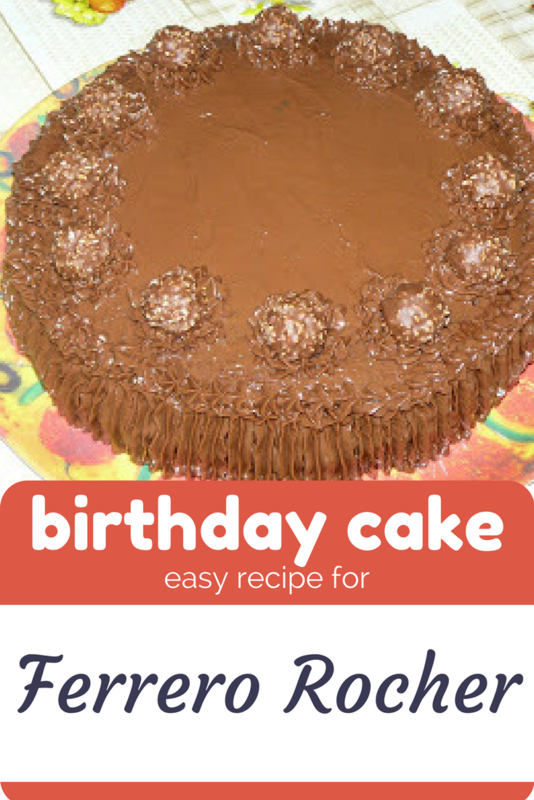 This Ferrero Rocher cake looks so delicious and decadent! Thanks for sharing your recipe at the #HomeMattersParty - hope you will link up with us again on Friday. Oh, this looks amazing. I want one. That looks scrumptious! 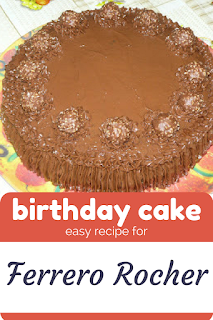 I love the Fererro Rocher sweets, they are one of my favourite, so baking a cake that has a similar taste is a fabulous idea! I bet everyone enjoyed your birthday cake. Un deliciu! Haha :) Thank you Daniela! And yes, everyone love it. This recipe is "swoon inspiring!" My favorite candy in the world is Fererro Rocher. This sounds perfect for family gatherings. This cake looks pretty without a lot of work! That's my kind of recipe! Thanks! Ferrero Rocher is my favorite candy! I could eat them all the time if my waistline was okay with it. I need to have a party so I can make this cake. 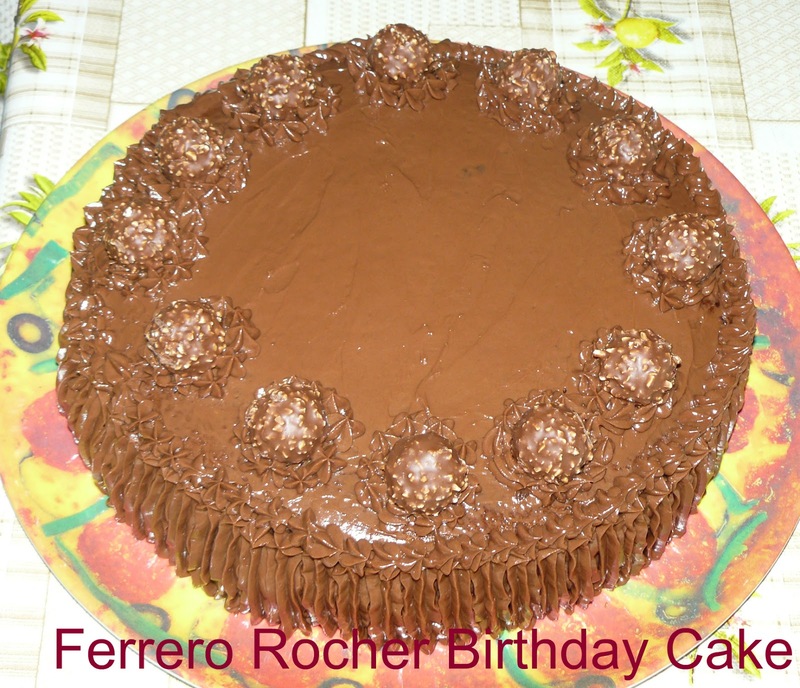 I love Ferroro Rocher and chocolate cake.. so this would be a perfect birthday cake for me.!! Love the idea. I wonder how can i replace this as vegan cake! looks delicious:)I am always chocolate girl. 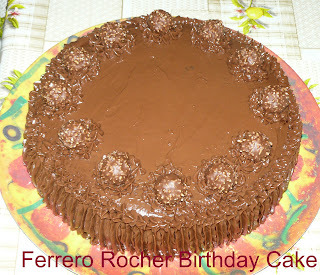 A few years ago I had a friend bake a Ferrero rocker birthday cake for me. To this day, I still remember how beautiful it was and it was incredibly delicious. I can't wait to try this one! I wish I could get a slice of this cake right out of the screen. It's one of my fav chocolate combination cake and looks absolutely yummm ! Look at all of the chocolate! This sounds like it would be great with a big glass of cold milk. That looks great. I love chocolate cake. Wish I had a piece right now. yay i love homemade easy recipes, thanks for this! I'd take note of this! This looks so tasty! I know a lot of people that would love it! I now know for sure what I'm going to do tomorrow! I hope it will look as good as yours! This look yummy and the recipe seems so easy and simple to make. I may try this. Thanks! Happy birthday! I love chocolate. If someone doesn't make this for me when my birthday comes along I will bake it myself if I have to. Ugh! These morsels are just the best so I could only imagine the cake. Sounds delicious and I'm going to have to make it sometime. Happy Birthday! These little morsels are just the tastiest! I will have to make this cake sometime, it sounds delicious. Happy Birthday! Oh, it looks so delicious! Cake is one of my favorites, especially chocolate. I would love to try the recipe. Happy Birthday! This looks amazing. I am just going to try this for my husband's bday and surprise him. Thanks for sharing such an easy recipe. This sounds delish. I love easy recipes...especially for baking. I try hard but I am just not a baker. But I will try. Wow, this cake looks so tasty. I never would have thought of adding Ferrero Rocher little candies to sweeten the treat, great idea! Oh wow. This cake looks all kinds of yummy. I would definitely want a piece!! Ooh wow this looks so good! I LOVE Ferrero rocher and although Im a terrible baker, would love to try and make this to eat it myself! This looks so delicious! Can I have a slice :) I am so making this over the weekend! Birthdays are the best especially when good cake is involved. I've been looking over the ingredients and I've never heard of mascarpone cheese. I hope I can find it around here. Oh my this looks so good. Its chocolate and thats my fav. Thanks for sharing. i wonder why men don't comment on recipe blogs! anyways, cakes are my favo and i appreciate your presentation. hope, i am gonna try it on my sweetheart's b'day next month. Ferrero Rocher is one of my favorite chocolate! This cake looks so tempting! I would love to try this! Its so easy to make. This cake looks so mouth watering. Will definitely try to make this at my home this weekend. My kids will love it. I love Fererro Rocher, they are some of my favorite chocolates. I think that your cake was not very difficult to make but with that hazelnut nutella cream it must have tasted so delicious! I love that this cake is chocolate on top of chocolate. Now I want to go grab a Ferrero Rocher chocolate at the store. They're so good! The cake looks so yummie. My sweet tooth is itching ha. If it tastes anythng like 'Ferero Rocher' chocolates, I'm sold. OMG FERRERO ROCHER IS MY FAV! Don't think I can wait until my birthday (in August) to make this. Hmmm which of my friend's bdays is coming up!?! Looks and sounds amazing! Thanks for sharing the steps as I would love to bake this some time soon. Everyone's mouths are probably going to drop but I do not like hazelnut. It just doesn't do it for me. I at times try cakes (not much of a good maker, though) and am pretty sure it is going to be finerliciious. This looks absolutely delicious! Do you have any other cakes inspired by chocolate candies?